Do silkies make good pets? Yes, Silkies are the almost perfect hens for all gardens. Silkie Chickens, with their gentle disposition and sociable nature, are delightful little characters that would make a great fit as a pet for many lifestyles and ages. They have five toes instead of four and are much smaller than most chickens. And they produce eggs, smallish eggs, around 40g, with big deep yellow yolks with not so much white, perhaps 3 per week. With supervision, they could make a good pet for families with young children, or even as an easy, novice pet for an older child to teach responsibility. For a Silkie, the lack of stiff quills in the feathers leave a cute fluffy ball, rendering them entirely flightless and incurably adorable. 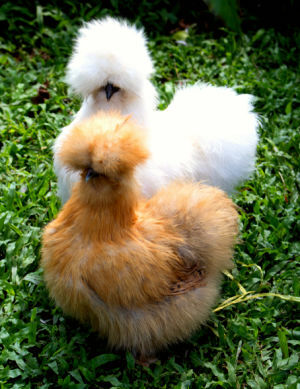 Below: An adorable pair of silkie hens. Other notable features include shaggy feathered legs, metallic light blue earlobes, and five toes on each foot instead of the usual four, a rare trait shared by only a small few other breeds and, last but not least, it’s breed standard for Silkies to have black skin, bones, and blood. They are small so can be kept in places large fowl can't. They’re quiet and easy going. They can not fly so wont be bothering your neighbours. Silkies like to held, petted or cuddled on laps while other breeds of chickens tend flap and squawk. They look like fluffy balls a bit like tribbles from star trek. Their feathers are soft to touch. They have a tendency to broodiness, indeed I found one mine trying to hatch 3 golf balls in a plant pot. They are not exactly productive layers, you will never get more than 120 eggs a year from a Silkie. Being unable to fly can make they more of a target for predators. Sometimes they need a little more care than other breeds of chickens. Especially in the damp, their feathers get wet easily and do have the waterproof characteristics of other chicken breeds. You may need a few extra chickens if you are bothered by the lack of eggs or when dealing with their broodiness. Unfortunately because of the crests and fluffy feathers they can also have some trouble seeing in their peripherals which means that they can be in danger when it comes to predators. Because they can’t see animals coming out of this blind spot it makes them easy to attack. It’s important to keep these types of chickens in a safe place, somewhere they can be kept safe from these predators. Yes, my silkies are always there to greet me whenever I see them and never stray far if I'm out and about. They take themselves to bed on their own and are never any trouble. Below: Even silkie teenages are easy to look after. Silkie Cockerels seem to be as docile and friendly as the hens. All chickens scratch. It's part of being a chicken. Silkies are really cute little fluffy chickens, very docile in nature and do not make as much of a mess of your garden as large fowl chickens will. In my experience silkies are much quieter than most chickens, The roosters still crow and the hens still cluck. To put it in perspective, I had mine in my front garden for 11 months before anyone of my neighbours even noticed them. One of my hens is quite talkative and sounds a bit like the hinges on a rusty gate but it is neither loud nor objectionable. Silkies are gentle and kind birds which actively seek out human company and adore being fussed over. 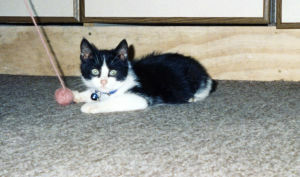 They tend to peep a lot and chatter as they follow you around, which they will do as soon as they are out and about. They make amazing mothers and love nothing more than raising a clutch of eggs, I have had one that sat 4 times in a year. Some see motherhood as their sole purpose in life. 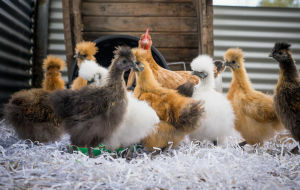 Silkies are more than happy to raise other types of farmyard poultry. They are one of the few chickens that will sit on a nest long enough to hatch ducks, guinea fowl or even geese. Do Silkie chickens make good house pets? Can you keep Silkie chickens as indoor pets. You can but I would not as a rule unless you have to. All chickens really need access to fresh grass and sunshine so must have some outdoors time. Keeping silkie chickens indoors may be a necessity at some times of the year if you get a lot of snow as this can clump in the foot feathers. Silkies in particular seem to crave following their human flock master about outdoors. They are a very friendly, calm and docile bird and interact very well with people and they will follow you around and chat to you. They have a wide vocabulary of squeaks, whistles clucks and peeps. 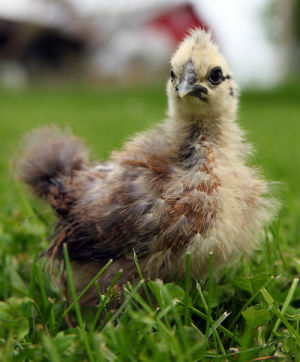 Convinced now to start keeping Silkie Chickens as Pets? Here are some important things to know. If you are not showing your birds you should trim the feathers covering the eyes a little so they can see better. Silkie Chickens are gentle enough to be paired with other similarly docile-tempered breeds. Being especially gentle, I highly recommend keeping bantam-sized Silkies with other bantams for their own safety. Something important to remember is that Silkie Chickens are entirely flightless. This comes as a disadvantage in a large, open yard with predators abound. 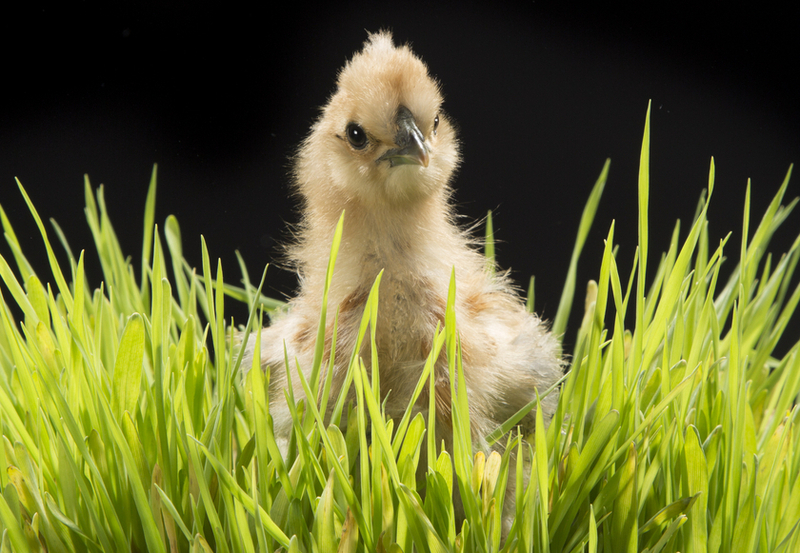 Even though most chickens are already poor fliers, the Silkie is an even easier victim. Coops should have a sizeable run with access to grass. 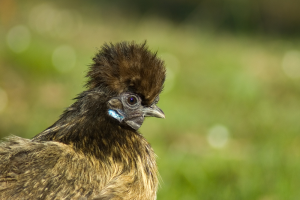 You need to be able to keep your Silkie safe when you can’t supervise free-ranging. Keeping a large, docile breed of Rooster around is an excellent way to help ensure the safety of your flock. Many roosters will eagerly fling themselves talons-first at predators before you’re able to react. Although Silkies are birds, expect some small grooming from time to time. Silkie Chickens won’t get knots and matting in their fluff, but their feathered feet can collect mud after heavy rain. Dried chunks of mud can cause discomfort for the bird. In a poorly maintained coop, faecal matter may collect on the feet. This can cause a bacterial infection if the chicken wounds themselves. Bathing Silkie Chickens kept outdoors is rarely necessary. Chickens are generally hygienic animals that keep themselves well-groomed with dust baths to cool off and remove bugs. In addition, you will notice them constantly preening their feathers. Keeping Silkie Chickens as Pets is a rewarding experience, as reported by many long-time chicken owners. 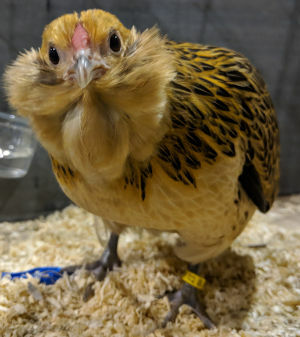 Read on to learn more about these special little birds, and why you should keep Silkie Chickens as pets. 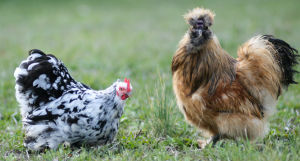 Silkie chickens, even the roosters are a remarkably easy option for a pet.